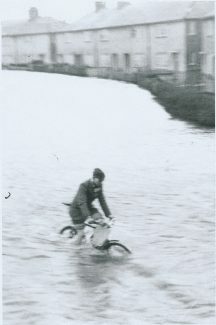 Jack Allen, who died in January 2012, aged 86, rows across the flood waters in Civic Square. Low pressure and high tide raised sea levels at Tilbury by six feet. 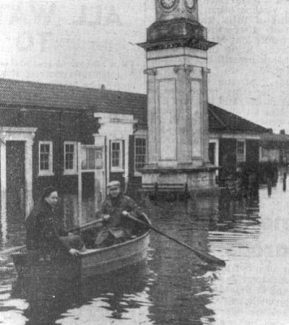 On 31st January 1953, a storm surge in the north sea caused extensive flooding in the Netherlands and Eastern England. The surge reached the Thames estuary at around midnight. By 2am, the sea wall at Bill Meroy Creek next to Tilbury Fort had given way and flood waters had inundated Tilbury Town. Similar flooding occurred in West Thurrock causing extensive damage to the industrial areas. Despite the damage, the floods resulted in the death of only one person in Thurrock. 2,500 homes were flooded and 1,300 people were evacuated. More than 2,500 homes in Tilbury were flooded and 1,300 people in the town and other low lying areas were evacuated to the higher ground. The Chadwell St Mary Primary School was used as a welfare centre. he hated water and used to get sick on the Tilbury Ferry! Not sure he rescued anybody but he tried to help.. The cyclist is my grandad Peter Jennings.